New Year's Day means a lot of different things to a lot of people. For most people who live in the Pasadena area (like me) it's all about the Rose Parade and Rose Bowl. For over 900 artists (including me) this New Year's Day is all about painting the first of thirty paintings in 30 straight days. Yikes! I have wanted to paint abstracts for many years. I have finally taken the plunge and decided to use this Thirty Day Challenge to explore painting abstracts. Of course I couln't make it that simple and just paint. I have spent over a month doing tons of research. I needed lots of new supplies. So I ordered thirty canvases and jars of acrylic paint and then purchased 54 small plastic jars (U-Line is the best and cheapest supplier). Since I have always been a color mixer, I am using these jars to mix my own acrylic colors and palettes. While doing my research I found a lot of abstract paintings I loved and many that I didn't. But one thing that stood out for sure, was the use of color. I decided to approach my abstract paitings a bit differently. I have decided to create four distinct color palettes. The are titled Fall, Winter, Spring and Summer. Each palette has 10 - 12 colors and all of my abstracts will be painted using my paint colors from one of these color palettes. I know what you are thinking, "how did I choose the colors for each palette"? I just did what I thought made sense. I selected over 100 paintings and photos with colors that I loved and then divided them in to four color palettes. 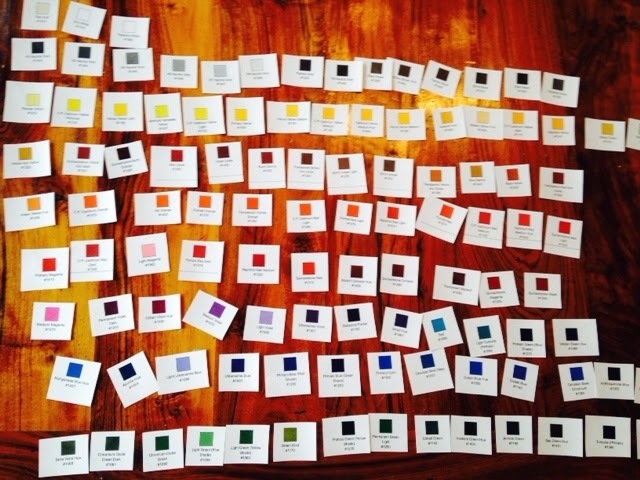 Then I used acrylic paint color swatches (pictured) to decide on the colors. From there I premixed all of my colors. None of my colors are straight from the jar ... I guess that would make too much sense. They are all mixed (to get just the right shade) and stored safely in my new jars! These photos are from my Fall palette. I should mention I am still finalizing my palettes and when they are ready I will post the colors. It's a big project (and process). Hopefully the four color palettes will be finalized by the time I finish my 30th abstract painting. Haha. I am also taking a weekly abstract class which starts next week. I cannot wait! I am offering Monday Online Studio painting classes beginning October 2014! Join me each month as we paint boats, roosters, glass, beach scenes, umbrellas, etc. with a palette knife!